[HD videos below] In the Dell Precision 7730 Mobile Workstation, two of the four SODIMM RAM slots are in the back and the other two in the front. 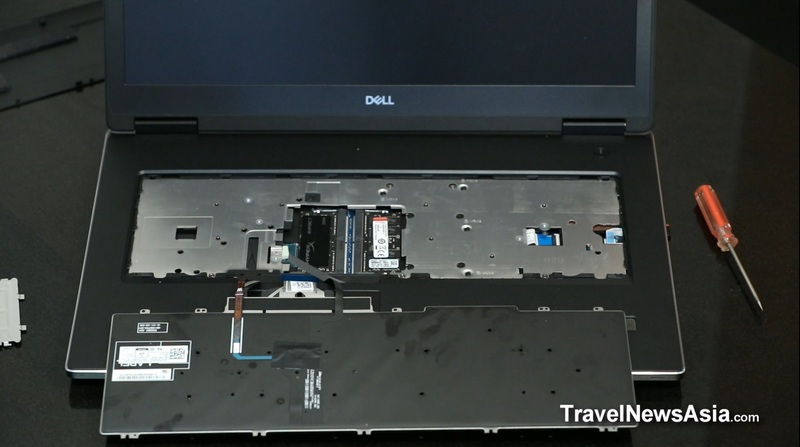 In our second video on this flagship laptop, we showed you how to access the two RAM slots in the back, and in this video we show you how to remove the keyboard so that you can access the two RAM slots in the front. The Dell Precision 7730 Mobile Workstation can have up to 128GB of SODIMM RAM so you could install 4 sticks of 32GB each once they become available. Most people will probably install 32GB or 64GB. However, while you can install RAM in both the back and the front you may want to fill the two RAM slots in the front first, as it makes the keyboard feel (and sound) a little more solid, especially around the area where you install the RAM. Removing the keyboard is a little fiddly, especially taking out and putting back the four delicate cables under the keyboard - and it is imperative that you do not fold, break or stretch them, but most people should be able to handle the process without too much difficulty.